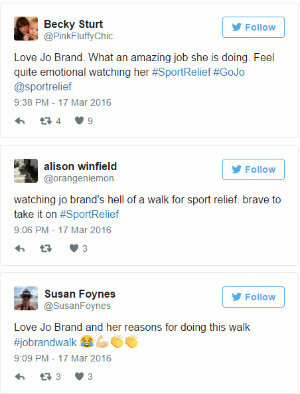 In her typically self-deprecating manner, comedian Jo Brand described herself as a ‘fat, old woman’ on Hell of a Walk, the one-off BBC show documenting her mammoth trek across Britain for Sport Relief. However those at home watching disagreed and naturally took to Twitter to express their awe, making her a surprising inspiration for exercise-shy folk everywhere. “On behalf of all the portly middle-aged women in the country, who need to get up off their bums, get a bit of exercise, live a bit longer, so they can bicker with their husbands a few more years, shout at their kids for a bit longer, and EAT MORE CHIPS,” she declared. The walk saw the 58 year old cover 20 miles per day over seven day from the Humber Bridge to Liverpool, and though accompanied by a team of masseurs, medics and well-wishers the journey was far from straightforward. Training was not as comprehensive as it ought to have been, and the miserable January weather was made even worse when storm Jonas swept in from America, leaving Brand to battle 70mph as she traversed the Pennines. As far as television programmes go, Hell of a Walk isn’t the most glamourous; the weather gloomy and the terrain rather grim and ordinary. But it was truly touching to see the level of support from the people she met along the way and of course Brand herself is a joy to watch; humble, hilarious and a bloody good sport.